The fourth installment in the legendary RPG series launched back in the mid-80s. The title was developed by inXile entertainment thanks to the funds raised at Kickstarter, and its production was overseen by Brian Fargo, the creator of the initial entry of the franchise. The Bard’s Tale IV for PC is the fourth major installment of the famous dungeon crawlers series that began with the release of The Bard’s Tale in 1985. The title was developed by inXile entertainment, the creators of Torment: Tides of Numenera, Hunted: The Demon’s Forge, and Wasteland 2. The Bard’s Tale IV goes back to the roots of the series which date back to the mid-80s. The project, which came to existence thanks to the fundraiser at Kickstarter, was overseen by Brian Fargo. The developer started his career at Interplay and worked on such titles as The Bard’s Tale, Neuromancer, Dragon Wars, Fallout, Fallout 2, Stonekeep, Baldur’s Gate, Icewind Dale, and Planescape: Torment. In The Bard’s Tale IV, the players are taken to the original fantasy world, which is clearly inspired by Scottish and Celtic culture and mythology, known from the previous installments of the series. We start the adventure in the vast city of Skara Brae and thence set out to numerous and dangerous ruins and dungeons. The players create their own party of adventurers, choosing from many available races—such as elves, humans, or half-orcs—and classes. The composition of our company is not meaningless and influences NPC’s attitude as well as the quest and dialogue line availability. The list of plot surprises goes on, though. Many decisions we will make in the course of the game may significantly change the image of the world and Skara Brae. The gameplay is similar to many classical dungeon crawlers. The players traverse non-linear labyrinths, dungeons, and ruins, all of which are full of various traps as well as logic puzzles. Some of the latter also use the complex physics engine. The available locations are grid-based in design—every character and opponents moves through its boxes. inXile entertainment decided to implement a phase turn-based combat system. What it means is that the party members perform all activities simultaneously. Thanks to this, we can make use of the synergic skills because some attacks and abilities affect one another. The magical music of our bards is also of great import for it can rapidly change the situation on the battlefield. What’s interesting, the developers value authenticity and therefore the ballads we hear were recorded in the actual Gaelic accent of the Scottish language, solely for the purposes of the game. The Bard’s Tale IV for PC is powered by Unreal Engine 4 which gave the developers significantly bigger technical possibilities than when they worked on their previous games. What’s interesting, the photogrammetry technique, which allows to scan real object and turn them into photorealistic 3D models, was used to design levels and scenography elements. 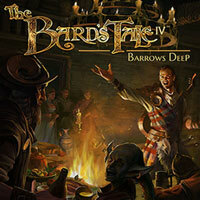 The Bard's Tale IV Barrows Deep Game Guide is a set of guidelines for all players which deal with character classes, skills, and spells available in the game. Our walkthrough describes every quest and puzzle of this role-playing fantasy adventure.